The Poser Alphabet is the first figure alphabet designed entirely in three dimensions. This design continues a tradition begun by the scribes in the Medieval times of forming images of people into letters to decorate and illuminate manuscripts and scriptures. Each pose set forms a letter when viewed from front and center. When seen from other angles the combined figures appear as fluid acrobatic or dance-like configurations. All poses are meticulously crafted, entirely in the round. The set consists of the entire Roman alphabet in capital letters, Arabic numerals, and several punctuation marks, plus several alternate letters for frequently used characters. 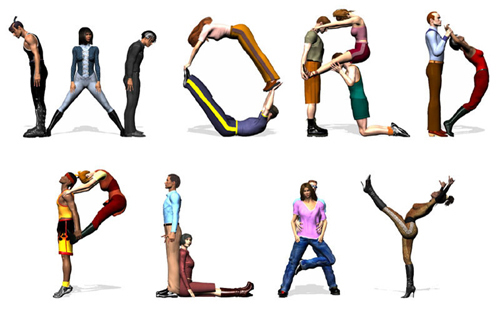 These figure-letters were created with Poser6 and the DAZ Millennium 3 characters on a Macintosh. 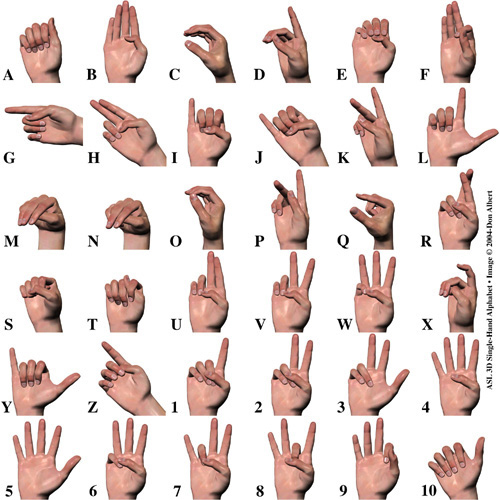 This alphabet is sold at DAZ3D, an online provider of 3D content. The User applies the pre-set letter templates to their own 3D human figure models, allowing them to clothe and arrange the people-letters according to their own designs. This is the latest of four such alphabets. Others were designed for the Poser 3, 4, & 6 characters.